MANILA – Renimelda Abiva, 53, could not stop crying as she spoke about the arrest of her son, Rene Boy on December 28. Mrs. Abiva said she could not believe that her son, an employee of the Department of Social Welfare and Development (DSWD) for more than two years, has been charged with murder in relation to an alleged ambush by the New People’s Army (NPA) in Tinoc, Ifugao on April 25 last year. Rene Boy, also an organizer of ACT Teachers party list, is one of the 28 activists arrested in a span of one month, according to human rights group Karapatan. Mrs. Abiva, who travelled all the way from their hometown in Aritao, Nueva Vizcaya, 231 kilometers from Manila, to join a press conference, January 11, called on the Aquino administration to release her son and all the others who were slapped with fabricated charges. Sixteen other individuals have been charged in connection with alleged NPA ambuscades. Among them are the two organizers of Courage , a federation of government employees unions, who were arrested on December 3 in Manila and detained in Daet, Camarines Norte. Randy Vegas, 40, and Raul Camposano, 51, were arrested on the same day in two separate incidents. They later found out that they have been charged with murder, theft and frustrated murder. The charges were in connection with their alleged participation in an ambush by the New People’s Army (NPA) against the Armed Forces of the Philippines in Maot, Labo, Camarines Norte on April 29, 2012. In an interview, Vegas’s wife, Teresa, who visited her husband during the holidays, said that prior to the arrest, she and her husband did not notice any threat or surveillance. At the time of the arrest, Teresa said Vegas and Camposano were assisting the employees of the Metropolitan Development Authority (MMDA) in their campaign for the implementation of the Collective Negotiations Agreement. Teresa, also an organizer of Courage, said she could not help but worry about her husband knowing how soldiers treat activists like them. Included in the Labo, Camarines Norte charge sheet are Kilusang Mayo Uno-National Capital Region leaders Roy Velez and Amelita Gamara. Others arrested were church worker Anecita Rojo in Bago City, Negros Occidental on December 7; farmers Dennis Ortiz, Eleceo Lopez and a 17-year-old boy, in Mulanay, Quezon on December 21. Nineteen farmers, including three minors, were also arrested by soldiers in Isabela, Negros Occidental on December 13. On Christmas day, Oligario Sebas, 65, was arrested in Negros Oriental and presented to the media as “Felimon Mendrez,” an alleged top-ranking NPA cadre in Central Visayas. Cristina Palabay, Karapatan secretary general, said those arrested are not NPA fighters but activists involved in advocacy work for people’s rights and welfare. The red baiting, Palabay said, is meant to justify the grave violations on civil and political rights of the victims. For George San Mateo, Piston secretary general, the arrests also aim to demonize progressive party list organizations. “The Aquino government has established a very dangerous pattern of inserting names in existing warrants of arrest to legitimize false charges and clamp down on persons whom it perceives as its enemies,” Palabay said. The human rights defender likened Oplan Bayanihan to Gloria Macapagal-Arroyo’s Oplan Bantay Laya. 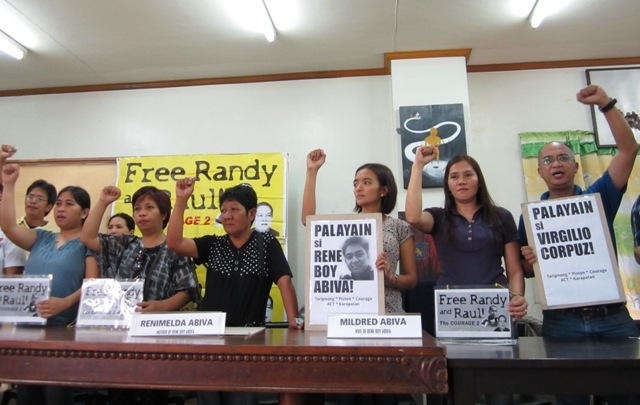 During the Arroyo administration, there were 342 activists  arrested and detained, according to Karapatan. As of November 2012, Karapatan recorded 123 political prisoners arrested and detained since Aquino assumed presidency.